Financial reporting fraud is in focus, including the role of corporate accounting staff and outside auditors, with the recent report of a near-record $22 million payout by the SEC to a former financial executive who blew the whistle on their then-employer, Monsanto. Although the SEC is prohibited by law from disclosing the identity of whistleblowers, Stuart Meissner, the attorney representing the unnamed whistleblower, made it known in February, when the SEC announced the settlement of its case against Monsanto , that a whistleblower provided information for the case, and stood to receive a maximum payout under the law of $24 million (30% of the 80 million company settlement). In fact, the SEC paid very close to that maximum payout in paying the unnamed whistleblower $22, a reflection of the significance of the information provided by the whistleblower. In announcing the Monsanto settlement in February, the SEC cited insufficient internal accounting controls, leading to booking full revenue from the sale of one of the company’s flagship products, Roundup weed-killer, without reducing that revenue for the expected impact of rebates offered on those sales. In fact, the SEC said, the improper financial reporting continued over a three-year period. Financial reporting and disclosure cases continue to be a high priority for the Commission and these charges show that corporations must be truthful in their earnings releases to investors and have sufficient internal accounting controls in place to prevent misleading statements. This type of conduct, which fails to recognize expenses associated with rebates for a flagship product in the period in which they occurred, is the latest page from a well-worn playbook of accounting misstatements. Stuart Meissner, the attorney who represented the whistleblower, noted in a press release issued by his firm, that the whistleblower initially brought the information directly to the SEC, after first raising the matter internally within the company, as required by the Dodd-Frank law’s provisions for whistleblower compensation. Meissner’s firm subsequently picked up the case on behalf of the whistleblower. Meissner, who is based in New York, said the whistleblower was not in the top tier of Monsanto financial executives. Meissner wouldn’t identify the man or say if he was based in St. Louis. He left Monsanto on his own accord and was not forced out, Meissner said. Meissner noted in his press release the role of whistleblowers in connection with the SEC’s renewed emphasis on the role of ‘gatekeepers’ – which the SEC has addressed in speeches as including corporate financial executives, audit committee members, legal staff, and outside auditors, and called for further scrutiny of the role of Monsanto’s auditors. In addition to the Commission’s role in enforcing compliance with standards promulgated by the FASB for issuers of financial statements, we also enforce the standards of the PCAOB for auditors. And, the Enforcement Division has launched its “Operation Broken Gate” initiative, which seeks to identify auditors who do not carry out their duties in accordance with professional standards. Here, the Division of Enforcement has been investigating the quality of audits to determine whether the auditors missed or ignored red flags; whether they have maintained proper documentation of the work performed; and whether they have complied with applicable professional standards. These efforts are directed to ensure that auditors satisfy their role as “public watchdogs.” And we have already seen impressive results. The near-record whistleblower payout of $22 million, the SEC notes, brings its total payouts to whistleblowers to over $100 million. What does this mean for you? At least two lessons are inherent in this story. Emphasize the importance of ethics from the top down, and walk the talk. Offer ways for employees to raise issues; e.g. consider internal hotlines. 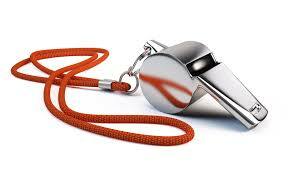 See this July 2014 CAQ webcast, How to Improve Your Whistleblower Program and Address Impediments to Repoorting. The role of leadership and ethics within corporate culture will also be addressed at the MACPA’s December 1 Quarterly Financial Leaders Series, featuring Karl Ahlrichs, SPHR. Do the right thing: whether you are a company official or outside auditor. If you see something, say something: Remember, the SEC’s Whistleblower program, as directed under the Dodd-Frank Act, requires potential whistleblowers to raise issues internally, and wait 120 days before coming to the SEC, to give the company time to handle the matter. Learn more about the SEC’s Whistleblower program.